I’m always up for trying new dinner recipes. So when I’m browsing pins on Pinterest, I’m keeping an eye open for dinner ideas that are simple yet look super delicious. When I saw this recipe from Damn Delicious pinned, I KNEW in an instant that our family needed to try it for dinner. Broccoli and Chicken Mac & Cheese. How could you go wrong with that? OH – and it’s a 30 minute meal? DONE! It’s on the menu! The night I ended up making this, my husband ended up working late… so he didn’t get to eat it while it was still hot and fresh. BUT, my teenager and baby ate it and they both had seconds! The hubby did end up eating it for lunch the next two days and has been begging me to make it again so he can enjoy it hot! If you wanted to make this healthier, I’d suggest using skim or non-fat milk and low fat cheese. And add more veggies too… this would be a very healthy meal! 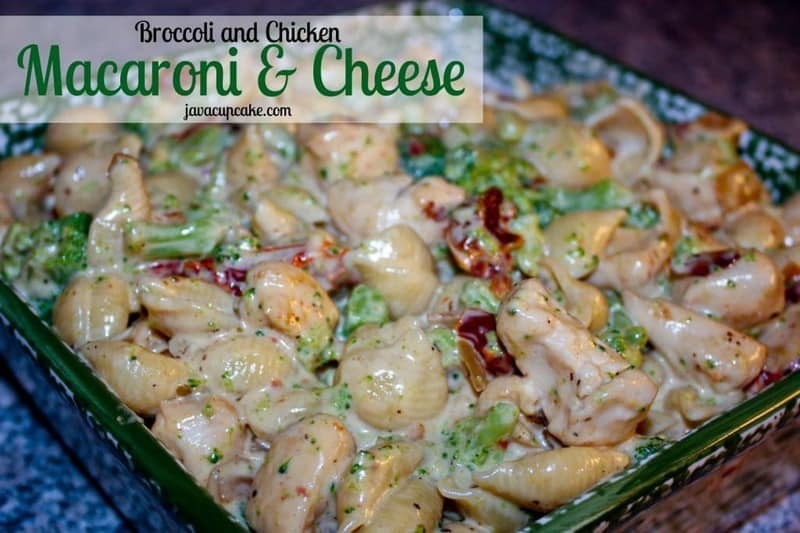 Chunks of chicken and broccoi with pasta shells covered in rich and creamy cheese sauce... in only 30 minutes! In a large pot of salted boiling water, cook the pasta shells for 8-9 minutes. Add the broccoli and bring back to a boil. Cook an additional 3 minutes or until pasta is tender. While the pasta is cooking, dice the onion then cut chicken into bite size pieces. Pour 1-2 Tbsp of the oil from the jar of the sun dried tomatoes into a large frying pan over medium-high heat. Check on the noodles & broccoli. Add the onions to the pan and cook for 3-4 minutes or until they start to lose their color. Add the chicken and cook until no longer pink. Season with salt and pepper. Move the chicken to a bowl and cover with foil. By this time, the noodles & broccoli should be cooked. Pour the noodles & broccoli into a strainer to drain the water off. Return them to the large pot. Using the same pan that you cooked the chicken in, whisk the heavy cream and tomatoes together over medium. 1/4 cup at a time, add the cheese and whisk until melted and smooth. alt and Pepper to taste. In the large pot with the noodles, add the chicken and onions and pour the cheese mixture over the top. Toss together until everything is evenly coated with cheese. Store in an air tight container for up to a week in the fridge! I think I would skip the sundried tomatoes and throw in some bacon and green peppers. Yum. This looks amazing. Thank you for sharing. You know… I thought that after too!! 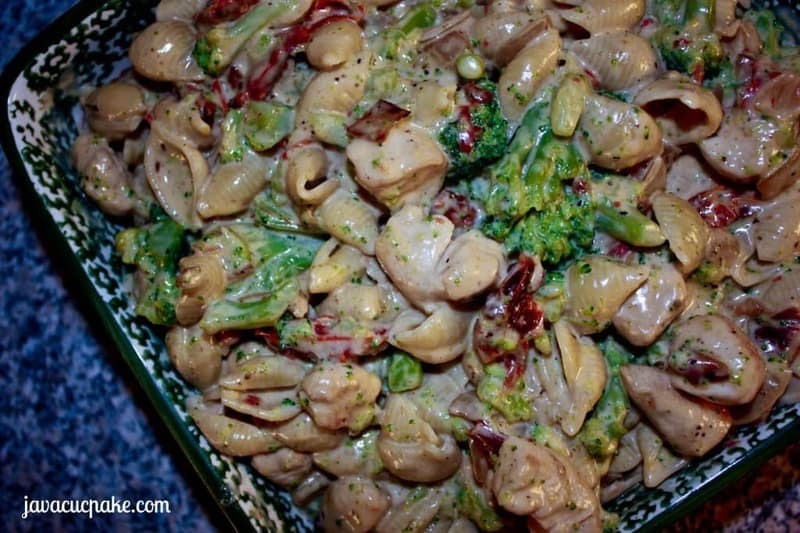 Bacon, more veggies… totally doing that next time! Made this, and it was awesome!!!!! That makes me so happy to hear, Antonia! I’m so happy you liked it!